Welcome back for Day 4 of Knitting and Crochet Blog Week! Today's topic: Seasonal knitting. How does the weather affect your craft? I don't think it does too much for me. I pretty much knit what I want, when I want. I definitely work on socks year round. Same for shawls. Although, I do find myself wanting super holey, lacey shawls more in the summer. In the winter, I think I go for more garter stitch. Just seems so cozy to me. I think I knit a little less in the summer, just because I am out more, but I still knit...a lot. I did just check my Rav notebook to see when I knit my most favorite hand warming item of all time, my Bird in Hand mittens. 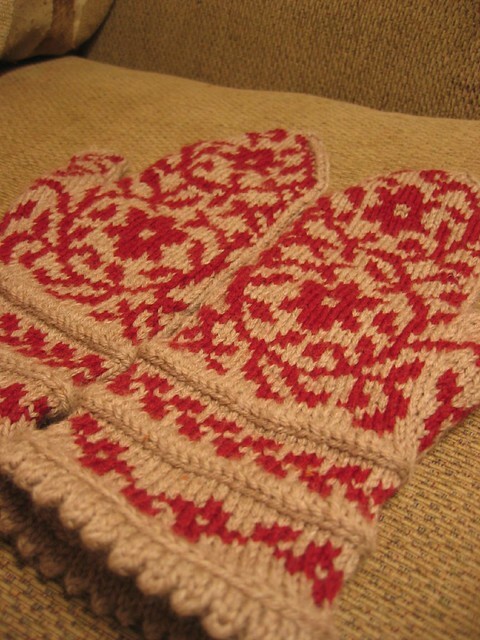 I knit those in January of 2009. Right in the middle of a Chicago winter. How about you? Do you knit certain things depending on the weather?